This pre-owned laptop is a late 2013 model is in good condition. It has a few dents, marks and scuffs on the casing as shown in the photos, and a brand new display fitted. 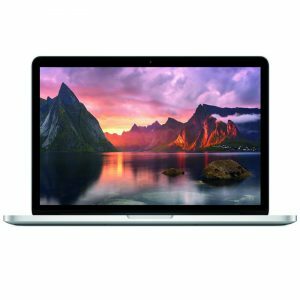 Apple MacBook Pro 13" with a Retina display that has over 4 million individual pixels! Super-fast flash architecture along with a 4th generation Intel Core processor make everything incredibly fast. The device is delivered with an Apple MagSafe 2 adapter and is fully tested by an Apple Authorised Technician.